I was always interested in blades. 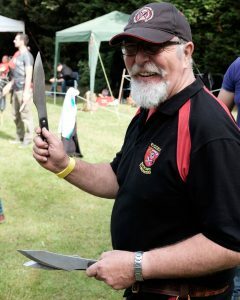 I first became interested in throwing at a Circus, but actually started to throw at a British Juggling Convention in 2010 with Peter Gamble and Richard Sunderland. It wasn’t until 2014 when I met John Taylor at a BJC again, and he encouraged both Alan Parish and myself to continue and expand our skill. Next year we met up again and after a purchase of some blades (J.T.Throwers), a new hobby took over. In my back garden a little range was set up, not knowing quite what to do. With the help of K.A.T.T.A. I soon realised that there was more to it than just throwing a blade to make it stick. 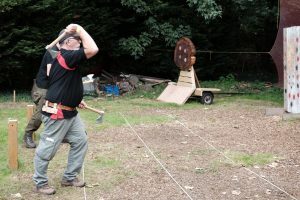 Alan and myself of like mind attended our first competition at Milton Keynes (Mark Bond we already knew through juggling) and realised we needed to learn a lot, and axes as well. We made small targets that we took around and others were becoming very interested. With this in mind Alan and I searched for an area where we could start a range of our own, and that is where Terry Longhurst came to our help and offered his Scout Land, and Essex Backyard Throwers was born. We are now the largest group in the U.K. Although not a great thrower, I feel I am a competent teacher, and love encouraging new throwers. 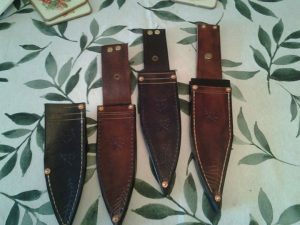 With my love of the sport, I have resurrected my skill of leather work, and now make sheaths, axe masks, and belts for fellow throwers across the globe. My throwing skill is improving all the time, but always missing top scores in competition (just the way I am), normally up there somewhere in top 15. Just love meeting others at National and International meets, and made good friends from loads of countries through the sport.